The aviation industry has been affected by the recent decade-long recession that assailed the US economy. Both verteran and newly established companies have had to lay off thousands of skilled workers. There was a significant reduction in workforce in many airlines and aircraft manufactures in the early 2000s. Another massive letting go of staff occured just three to four years ago. These industry-wide lay-offs affected both airlines and aircraft manufacturers. Those who were let go had no choice but to establish themselves in related industries. Some have found employment abroad where their skills are very much in-demand. These experienced workers receive very competitive aviation technician salary from their foreign employers. It is reasonable to assume that these experienced industry veterans would opt to stay where they are. And the rest of those affected by the recession have already moved on to other things. Now that the optimism for full recovery is highest that in ever was, the positions that they left are needing to be filled. The aviation technician is assigned some very complicated tasks that that revolve around car of an aircraft’s working parts.. The job decription revolves around installation, maintenance and repair of engine and airframe components. 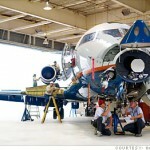 This also include servicing jet engines and tires and replacing cockpit instruments and airplane wiring when necessary. It may sound simple, but the specific set of skills of an aviation technician is what’s keeping millions of people who patronize air transport safe every single day. These individuals are primarily responsible for determining whether airplanes are air worthy. Aside from doing regular maintenance checks on aircraft people who receive the standard aviation technician salary are also in charge of replacement. The aviation technician removes damaged parts of aircraft when necessary in order to ensure safety of crew and passengers. Hazardous and risky conditions are identified based on concepts, procedures, and protocols that are used as gold standard in the aviation industry. Based on surveys, the salary of around 2008 was pegged at $16-$33 per hour. Another study put the range at $20-$29 per hour with the highest average pay at $30. Generally, the pay is higher for those doing maintenance work on huge jet aircrafts, and those employed by major airlines and federal agencies. To be eligible for the job of aviation technician a high school diploma or equivalent certification is required. Training and/or apprenticeship on specific skills or specialized services are required prior to employment by aircraft or airlines. The benefits typically received by avionics techs include life and health insurance. They may also be travel benefits for the technician and the immediate family if the employer is an airline. There is a growing demand for skilled labor in the aviation industry. With the economy slowly but surely on a comeback, openings for aviation technicians with competitive salary offers are cropping up all over the country. Many companies are now actively hiring contractors and full time employees offering competitive aviation technician salary via the Internet. And some are reportedly giving out flyers on the streets.